Not sure how well known this is but I’ve just noticed that in the latest SDK emulator, the hardware search button also searches the Marketplace as well as the web. 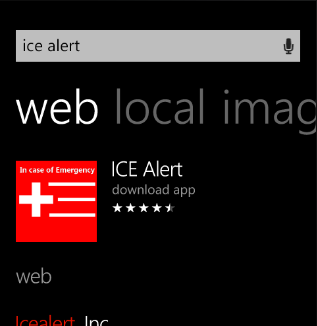 For example, if I type in “ICE Alert”, it returns the usual web results (using Bing), but also provides a link to the ICE Alert app within the Marketplace (Screenshot below). This does not happen on the device (which is running the latest Mango image), just the emulator. I’m guessing it will start working on the device once Mango hits RTM.